Fully controllable using your cell phone or mobile device, the August Smart Lock is the latest must-have technology. 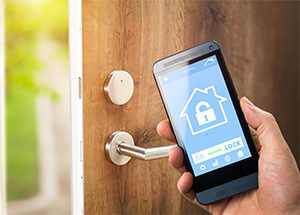 With a quick set up, you can add secure, keyless entry to your home. One of the best features of the August Smart Lock is the ability to give out codes to family and friends without having to lend a key to anyone. Provide access using the mobile app and never worry about who can get into your home again. The DoorSense and Auto-Lock features will give you peace of mind that your home is secure when you are away. No need to enter anything in when you get home; the door auto senses you and unlocks the door automatically. The August Smart Lock has won accolades from CNet, Wired, Fortune, and the Wall Street Journal. Based on its whole host of features, it’s no wonder.